Volkswagen showcases, in a series of new ads, the variety of features offered by its VW Car-Net app, which is available for free download on App Store and Google Play Store. One of the spots opens with a young man in his Volkswagen SUV, waiting impatiently in a parking lot for some news. 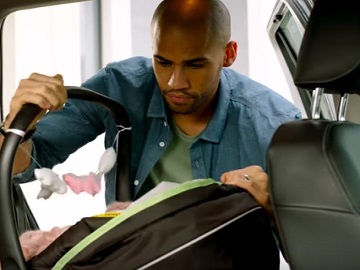 In the meantime, he checks the things in the backseat, such as a baby bottle, the infant car seat, and more, making sure they are all at hand. When he finally gets a push notification on the status of his car, letting him know it is good to go, he sets out to pick up his wife and their newborn baby from the patient pick up area. The ad also informs that with VW Car-Net Security & Service Vehicle Health Reports you know “your VW is in good health to transport your precious cargo”. VW Car-Net app also enables subscribers to check, thanks to the Remote Vehicle access, if their car’s doors are locked, if there is enough fuel, activate the horn and lights, and even see where their vehicle is parked, using a handy little map. The newest app version also includes new features such as Valet Alerts, Curfew Alerts, and Parking Information when searching for a POI. The service is available on the following 2014 and newer VW models: CC, EOS, Beetle (Convertible and Coupe), Jetta (SE with Connectivity, SEL, TDI, GLI, and Hybrid), Passat (SE, SEL Premium, including TDI and VR6), Tiguan (SE, SEL, R-Line and Limited); model year 2015 and newer Golf/GTI/R/SportWagen and e-Golf models; Golf Alltrack, Atlas and Arteon.